Siphiwe Tshabalala’s clinical counter-attacking goal stemmed from the manager’s switch early in the second half to move him more central. Of all the South Afrcian players, it was probably Steven Pienaar who carried the hopes of his nation greatest before the game. Playing just off the central striker, he was given the task of orchestrating and linking up the midfield and attack for Katlego Mphela to run onto but Mexico’s movement and possession, particularly in the first half, deemed that difficult. 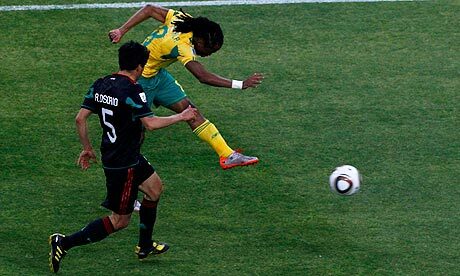 Mexico’s Rafael Marquez, playing in a half sweeper type role whereby he was detailed to move into defensive midfield when in possession, had done a fantastic man-marking job on Pienaar prior to South Africa’s goal. Indeed, Marquez showed just why a sweeper, or a spare centre back who can pushed out of the back line can present a key advantage to the practising side. He was able track Pienaar’s runs relatively easily as the playmaker was exclusively operating in the same zone as himand as a result South Africa’s ball retention suffered. However, Carlos Alberto Parriera brief switch at the start of the second half, moving Pienaar to the left and pushing Siphiwe Tshabalala more centrally posed Marquez an altogether different proposition. Suddenly, there was a less defined threat for Marquez to deal with as Tshabalala’s starting point was deeper than Pienaar’s and the classy midfielder’s energy and strong running from deep was altogether more difficult to mark. And Tshabalala duly took advantage by finishing off a fantastically clinical counter-attack. In that short period of play, Marquez showed also why playing such a role can be dangerous as he pushed up, it allowed South Africa’s runners more space to take advantage. “The Mexicans are the most direct team in the World Cup and in the second half we were able to find a balance,” Parriera told the press after his side struggled to deal with el Tri in the first-half. The goal also posed Parreira some questions of his own as there is a feeling that the Brazilian is trying to build a style of play that the South African’s are not suited to.”The league games here are like table tennis – nobody keeps the ball,” stated Parreira before the game, (who had been drilling his local players on shape, fitness and ball possession in recent months). As Tshabalala’s goal showed and indeed the performance in the second half, South Africa are a team which thrive on movement, stamina, and short bursts of one-touch passing and any success of the home nation will surely be built on exploiting those key strengths. Rafael Marquez, however, denied South Africa the dream start as poor marking once again from a set-piece allowed the Barcelona man to steal in for the equaliser. 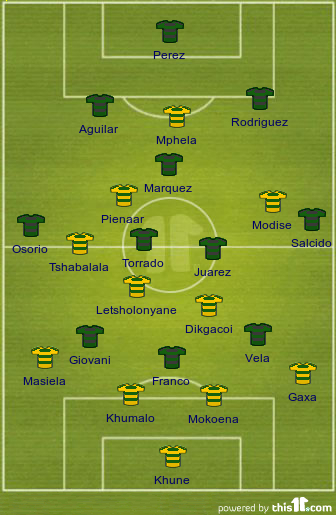 Carlos Alberto Parriera’s second half switch to move Pienaar to the left and push Tshbalala into central midfield allowed South Africa to profit from strong late running, that of which led to their goal. Yeah, it was good thinking by the Bafana Bafana coach to make the switch. I totally agree that if the South African players fully utilise their pace & maintain high level of concentration at the back, then they can surprise a lot of so called big dogs.Another thing that could help is to believe in themselves that they are capable of going all the way. What did you make of Argentina’s shape against Nigeria? It seems to be a variation of the Brazil formation, with Tevez playing the Robinho role on the right and Di Maria on the left. Di Maria looked shackled and out of sorts though, did a lot of defensive work. And Veron had to cover so much distance, he might lose out to other teams who look to press him. The Marquez role is quite interesting. Maybe Song can play something similar at Arsenal. Maradona doesn’t exactly do sophistication apart from his facial hair so I would say that formation was quite a bog standard 4-2-3-1, only open to interpretation due to the differing styles of the players (i.e. Tevez is a striker but is asked to play out wide but you wouldn’t expect him to perform the role as well as a wide forward). Maradona said he is looking to use a bit of tactics from Menotti in 78 and Bilardo in 86 so expect a couple of formation changes but the back four will be defensive and Messi will be given a free reign.